Memory your wonderful moments during the trip with Hizek Bluetooth Selfie Stick! How to use the Bluetooth Remote? The stable tripod of our bluetooth selfie stick with non-slip foot can better help your phone to photograph remarkable. Our bluetooth selfie stick is suitable for all phones up to 3.14 inches width. Ideal for iPhone, Samsung, other Android phone.We suggest that taking off your phone case to fit the bluetooth selfie stick if your phone case is large. 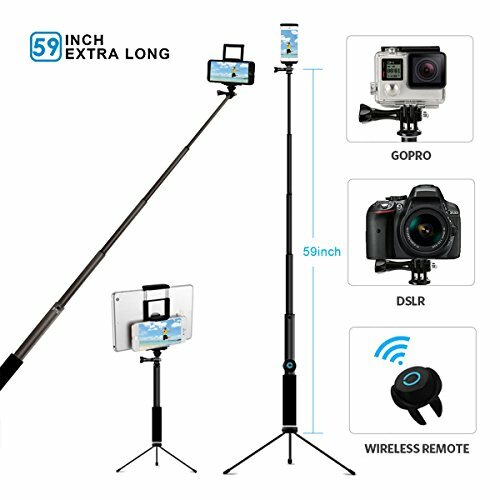 Assembled Tripod -- The tripod can be integrated with the selfie stick skillfully, very easy to assemble or fold up the tripod.Longest stable tripod (10.1inch) on the market for better performance, you can easily switch the Selfie Stick to a tripod. Perfect for any desk, tabletop, ground, uneven surfaces, or wrapped around the back of a chair, railing, branch, or pole. Anti-slip Durability Design -- Our selfie stick is made from anodized aluminum rod and anti-slip rubber handle of anti-rust, which satisfies all the requirements of the selfie stick, which is rugged and comfortable to use. Adjustable Height -- The 270°rotation head helps you get the prefect angle, you can rotate the phone holder and select the camera mode (horizontal or vertical). NOTE: Please screw the tightness of the knob to prevent the phone from falling down.You could get long enough height from 15 inches to 59 inches of elongation. Lifetime Quality Care -- Compatible with 4.72 to 7.87 inches of Tablet PC, 2.75 to 3.74 inch smartphone and mobile tripod and monopod gopro camera, iPad, mini projector.12 months warranty guarantee for product defects and 30 days no hassle return and refund for incompatibility,friendly customer care provided by Hizek. Acuvar 50" Smartphone/Camera Tripod with Rotating Mount. Fits iPhone X, 8, 8+, 7, 7 Plus, 6, 6 Plus, 5s Samsung Galaxy, Android, etc.